12.000 years after the events of Sousei no Aquarion, mankind is threatened by a new enemy from other dimension labeled "Abductors", who just like the Shadow Angels, invade the human cities to kidnap its inhabitants. To defend humanity from this invasion, the Neo-DEAVA organization establish two teams, one composed of only males and other of only females, each one piloting their own giant machines called "Aquaria". 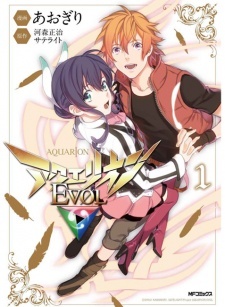 To protect his new friend Mikono, teenager Amata Sora decided to use the powers he has kept secret his entire life and by combining Vectors with male and female pilots into one single robot, the legendary giant Aquarion is reborn once more.